Funds from all our fundraising efforts enhance the learning experience of Ruskin Students, and we all appreciate your generosity! You may wish to donate cash rather than supplies. With the money, we are able to purchase supplies at a discounted rate. Check our calendar link often for more information. Proceeds go to classroom and science materials, field trips and assemblies. Save the Box Tops labels! We earn $0.10 for each label you bring to school. Earn Credit for our school every time you make a purchase with your card. Register for a S.H.A.R.E.S. 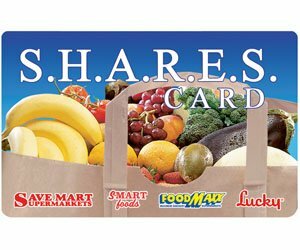 card at all Savemart and Lucky Grocery Stores and link your phone number to donate a percentage for Ruskin. The school will then receive the benefits of a quarterly check for 3% of the qualified purchases. It's that easy! This is the most important source of funding for P.T.A. Best tool we have to put new and exciting books in the hands of children to inspire them to read for fun, read for information, read for life. Proceeds to upgrade library book /video collection, and materials to maintain library in good working order. Bring your used empty ink jet containers, old cell phones and mp3 players to the office for recycling.